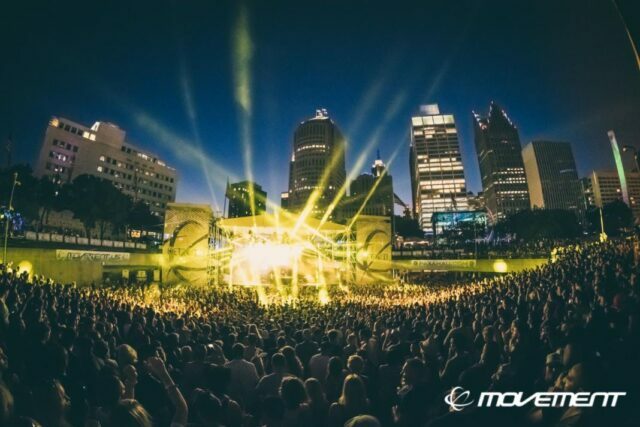 The distant sounds of bass-thumping techno boomed from around the city as Detroit prepared for Movement Music Festival 2017, a celebration of the pulsating techno that has once come to define the city’s central cultural developments. I had made a plan and scheduled my must-see artists, including legendary Richie Hawtin, presenting his visually stunning Close set, TESTPILOT, also known as deadmau5’s techno alter ego, Carl Cox, the quintessential king of techno, The Belleville Three, as in the originators of Detroit techno, Adam Beyer, Nicole Moudaber, Honey Dijon, Dixon, Carl Craig, Barclay Crenshaw, and so many more talented artists. I quickly learned to follow the direction of my group, as well as open myself up to new possibilities in order to live in the moment and appreciate techno for what it is. To me, the genre has no pauses, no breaks, nor lapses in the feeling of wanting to move. Between the main stage, the pyramid stage, the underground, and so many unique showcases of mixing ability, I got lost in the drumcode of each DJ and loved every minute of it. Hart Plaza saw an influx of people from all ages, background, ethnicities and religious inclinations – all in downtown Detroit to relish in a movement that has provided so much to so many. Providing the initial blueprint for Detroit techno in the 1980’s, The Belleville Three promoted cultural awareness of the African-American community through a unique sound. 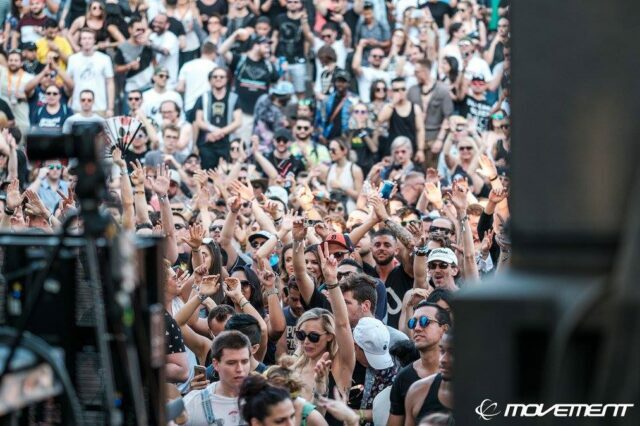 The originals set the stage for so many DJs to explore the genre, igniting a group of people to appreciate the sound. 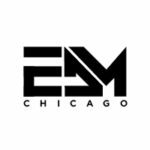 In conjunction with notably distinct Chicago house, techno gained popularity as a separate genre, with its own characteristics and identifiable patterns. In the 90’s and today, many unique offshoots of techno have risen including Richie Hawtin’s unique (almost prodigal) minimalist techno and an entirely new sphere of a social movement in Germany, with acts like Kraftwerk bringing light to establishing peace between East and West Germany during unification. The genre truly speaks to art as a social and political movement, as followers for decades have been expressing themselves through dance and achieving small acts of progress in unison. 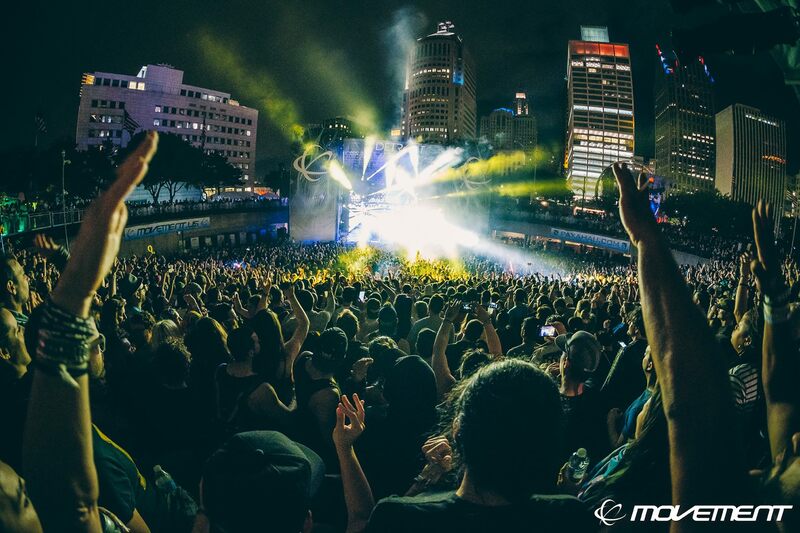 Saturday introduced us to the Movement stages, six different setups including the Main Stage, Red Bull Music Academy, Stargate (presented by THUMP), Pyramid Stage, Undeground Stage (by Resident Advisor), and Made in Detroit. Each stage featured its own uniquely crafted set of artists, hailing from similar backgrounds, labels, or general styles. The Pyramid Stage showcased acts like Coyu, Rodriguez Jr., Dusky, Ben Klock, and Pan-Pot, adjacent to a beautiful Lake St. Clair across from Canada. Each act brought its unique style of mixing, but the general vibe of this area was a lot of dancing! The dancefloor featured a large block of steps in amphitheater mode, which allowed for more space to see and move around. I pretty much stayed at this stage almost the entire afternoon, going back and forth to get the essentials. The Belleville Three was truly a privilege to see, as the originators of Detroit techno truly brought an incredible performance. The trio brought us back to a time of innovation in sound and they weren’t afraid to experiment and have fun with it. The truly iconic aspect of their performance was how all three were in perfect sync, each adding his own element to the mixing in unison to truly embrace all that they have achieved for Detroit. Richie Hawtin Close was truly an experience of a lifetime. Hawtin performed this set for the second time at Movement, following Coachella, and brought his stunning visuals and truly groundbreaking beats and pulsating rhythms to the Main Stage. The audience could see, in a blurringly sharp animation, Richie Hawtin’s live mixing. Like none other, the Canadian artist stunned and left the crowd speechless with movement and emotion, basking in over 20 years of pushing the boundaries of music. Sunday we ventured into a little more variety, checking out the Origins Elevation stage with the house sounds of The Saunderson Brothers, Heidi, Cajmere and Seth Troxler. This stage presented by THUMP brought an eclectic lineup all weekend. In a similar fashion, Chicago’s own Honey Dijon crushed her house performance at the Red Bull stage, allowing our group to get through the rain with some sweet and funky tunes. We also escaped the rain by going into the Underground Stage, catching lesser known acts like Ryan Elliott, Sleep Archive, and DVS1. These techno heavy-hitters illuminated the quasi-claustrophobic stage with their bass-thumping rhythms that entranced everyone stuck there. It truly was something I had never seen before, and I fully began to appreciate the hypnotizing patterns through my earplugs. 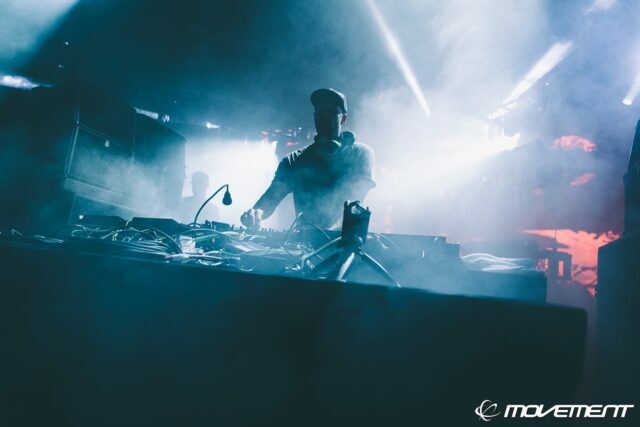 Adam Beyer, part of Drumcode Records along with Nicole Moudaber, performed a flawless set. TESTPILOT, deadmau5’s alter ego, experienced quite a difficult time due to the impending storm that hit us right before his performance. The forty minutes of waiting that ensued drew a polarizing response for the crowd, as Joel Zimmerman began trolling the crowd, drinking and making (quite dark) jokes about DJs, death, and everything in between. What followed when he finally began was an experience lived only once before, that truly highlighted the quality of production the Canadian artist hampers on in his music. I think we all sort of forgave Joel when he showed us his techno prowess, and it was wonderful, even until his mixer broke due to the rain (womp womp). When Movement ends, it doesn’t necessarily stop . Just like the slow, smooth transition of techno, the after parties hosted in Detroit’s downtown area are plenty. Out of the many choices available, Sunday night gave us Interface, a Blank Code, three-stage production in The Works Detroit. A club so iconic and characteristic of something you’d see in a movie, the venue paved way for over eight hours of techno of different varieties. I unfortunately did not make it to the 6 AM DVS1 start time (and Old Miami afterward – I really tried), but the infectious music that dominated that nightclub truly was a feat. Mount Kimbie was a highlight of day 3, Monday, showing us a minimalist, vocal set at the Red Bull Stage. In quite a smooth transition, Kate Simko brought her chill, yet groovy sound to the Paradise stage (the one presented by THUMP). Patrick Topping b2b Nathan Barato allowed us to get through a bit of a rainstorm, but the house-y set was worth the struggle. Switching between this stage, which later featured an impeccable Kerri Chandler, and the Pyramid stage with Mind Against and Recondite one after the other, was a great decision. The crowd at both stages really kept it going through a tiring third day of moving non-stop. I caught a little bit of the Dirtybird influence with Barclay Crenshaw (aka Claude Vonstroke), which was quite different from everything else in that he infuses more eclectic hip-hop beats into his set. Carl Craig and the Versus Synthesizer Ensemble followed at the Main Stage, showcasing one of the most unique performances of live piano and instruments paired with an electronic setup. A true classic could only be followed by what some would consider the true legend of house and techno, Carl Cox. The 54-year old British legend was the perfect close to an incredible weekend, followed by a b2b set with Joseph Capriati at the Masonic Temple after (all while hoping I could catch some semblance of sleep at some point in the near future, but still not being able to bring myself to leave). Left almost wrecked due to the once-powerful influence of the automobile industry, Detroit has experienced a significant amount of progress in the past couple of years. 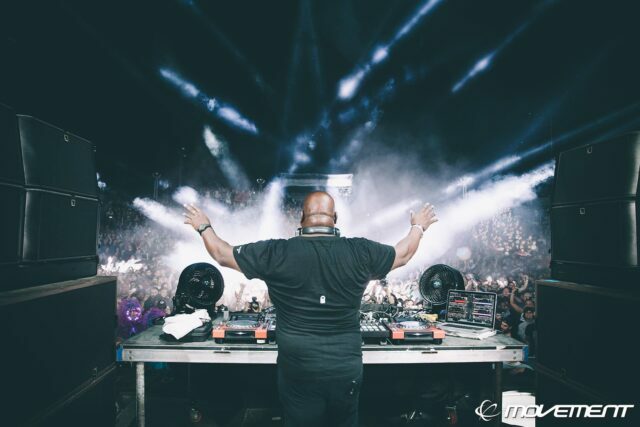 As Carl Cox yelled out during his closing set, “all these DJs, they’re playing your city” – a city of imperfect conditions, but of an aspiration to truly advance as a positive community of true cultural influence. Between the friendly festival-goers and locals and the amazing food (Greek, pizza, everything..), Detroit is truly revitalizing. And if there’s anything that I’ve taken away from many festival experiences, and this one in particular, it’s that music and collective dancing is a force for change, for positive growth and appreciation for one another, even if the world outside the music isn’t as cooperative. 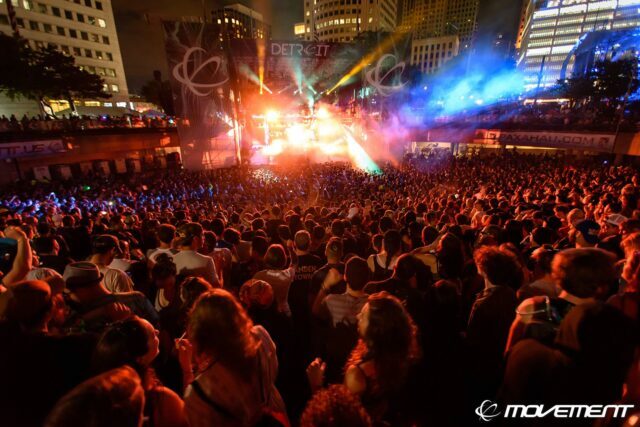 The powerful thing about techno is that it has the ability to unify and transcend beyond our preconceived notions of each other, and serves as a beautiful cultural emblem of Detroit’s past, present, and future. 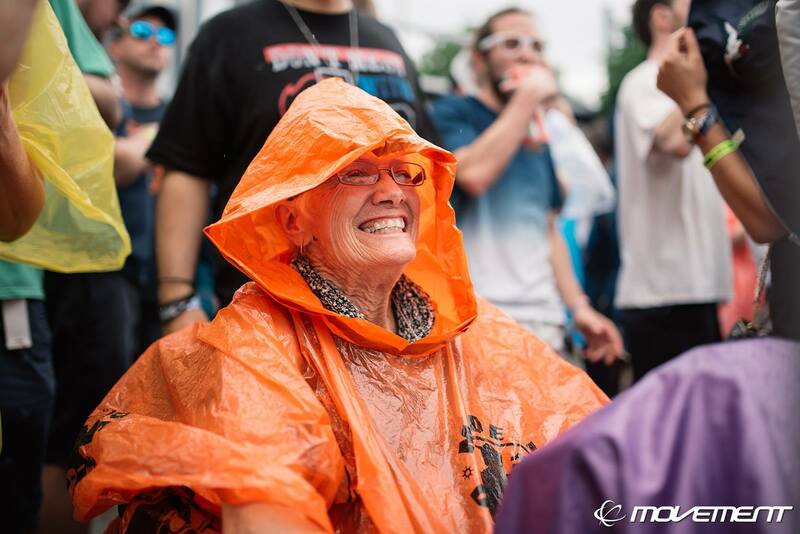 And shout out to Grandma Techno (whom, I wish I could have talked to) for showing us what it’s all about.